Allyson Healey is on a graduation trip throughout Europe when she happens to meet Wilhelm, a Dutch actor performing in Twelfth Night at a park in Stratford. 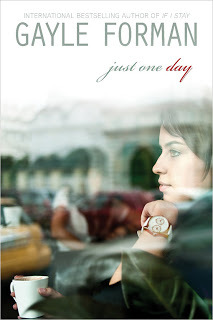 The connection between the two is intense, unusual, and undeniable, and before Allyson can think about what's she doing, she's calling herself Lulu and on a train to France to spend just one day with Wilhelm. The trip is surreal...until Wilhelm disappears without ever saying goodbye. Allyson is devastated and confused, but the experience causes her to take a close look at how she's living her life, and forces her to ask some hard questions: What do I want? How do I find the courage to achieve it? Is it too late to take control of my own life? Like she did with If I Stay, Forman fearlessly tackles the big questions of life with a deft hand. There is magic and serendipity in Just One Day, but it's not overdone or unrealistic, and the charm is found in the clever balance of nerve and chance. The character growth in the novel is beautiful, most prominently for Allyson, but also for her best friend Melanie, and even for Wilhelm in the one day that the readers have to get to know him. Allyson really struggles with letting people tell her what to do and what to think, and her experience with Wilhelm opens up a new world for her. However, it isn't until she is faced with the reality that her life at home isn't what she wants and is able to let go of her parents' expectations and her past that she is able to figure out what she wants. Her motivation and drive are admirable, and her adventures facing her fears and her emotions are ultimately triumphant. Every little detail adds up to something important in Just One Day as Forman demonstrates how experiences shape our lives and the magic that words and places hold. Cover Comments: I love this cover. I like the use of light and reflection and the slight blurriness, and the model on the cover matches Allyson quite well, from the hair to the watch. It's pretty, but not too generic. Also, keep an eye out for the sequel, Just One Year, which will tell Wilhelm's story! It'll be out sometime in the Fall of 2013.